Dehradun, Aug 10, 2018 : An embarrassing gaffe with the Indian tricolour ahead of Independence Day by Congress workers has left the party red faced. In a rally taken out by Uttarakhand Congress leaders and cadres, images of the tricolour being hoisted upside down surfaced on social media. 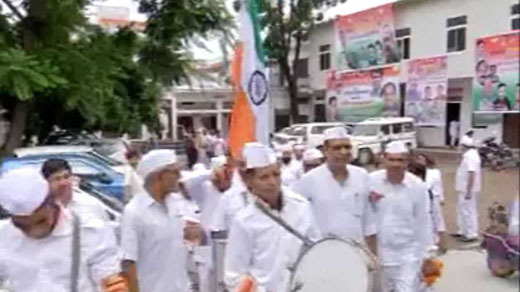 The rally was observing the 76th anniversary of the Quit India Movement. In the 2017 Assembly elections, the Bharatiya Janta Party won by a landslide margin, to form the state government with Trivendra Singh Rawat as the Chief Minister of Uttarakhand. The Bharatiya Janata Party (BJP) won 57 seats in the 71-member Assembly, while the Congress won just 11 seats.